T1 sized, 3mm (MF SX3s) midget flanged incandescent replacement indicator featuring a high intensity LED element. 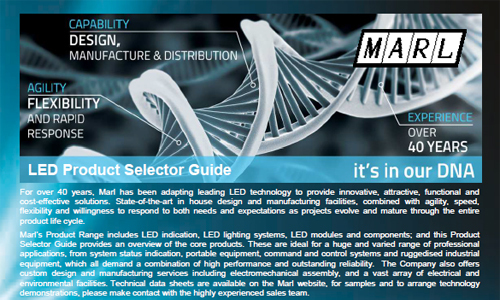 Integral circuitry has been designed to facilitate a range of voltage options. Termination is centre contact Anode (Centre contact Cathode is available). This particular device is manufactured with a flat-topped LED to provide excellent wide angle viewing for switchtop and annunciator illumination. Benefits include high optical performance, lower heat generation and outstanding reliability. 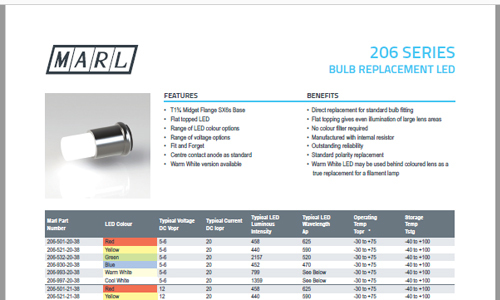 Datasheets attached. T1¾ sized, 5mm (MF Sx6s) midget flanged incandescent replacement indicator featuring a high intensity LED element. Integral circuitry has been designed to facilitate a range of voltage options. Termination is centre contact Anode (Centre contact Cathode is available). This particular device is manufactured with a flat-topped LED to provide excellent wide angle viewing for switchtop and annunciator illumination. Benefits include high optical performance, lower heat generation and outstanding reliability. 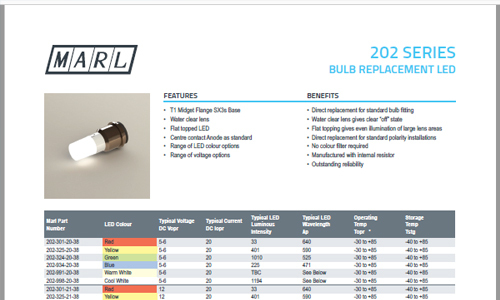 Datasheets attached.